If you have bad memories of wood stoves as a child, take heart: Modern wood stoves are a far cry from the smoke- and carbon-belching appliances of years past. Modern stoves use either a catalytic converter or secondary combustion, which ignites the gases coming off burning wood, for a clean, efficient burn. In many cases, new wood stoves burn even more cleanly than pellet stoves. Wood-burning stoves are also simpler than pellet stoves, making them easier to install and repair. Logs are also the ideal do-it-yourself fuel, although to cut your own you'll need a chainsaw, safety equipment, manual or powered wood splitter, and a way to transport the logs -- not to mention up to a year for the wood to season before you burn it. Hardwoods like oak can take two or three years to season. Of course, you can also buy firewood. Unless you live far from any trees, wood logs are the easiest solid fuel to find, even in the city. Tree trimmers, landscapers, and cabinet and furniture shops all make scraps as they work. The main drawbacks are the cost of installing an insulated chimney, then the need to reload and tend the fire at least twice a day. In 2015, the Environmental Protection Agency set a new particulate emissions limit for wood stoves that took effect at the beginning of 2016. Wood stoves that don't meet or beat the 4.5 gram/hour emissions limit can no longer be manufactured for sale in the United States, although wood stoves already in use are exempt from this rule. Historically, Oregon and Washington have maintained even stricter emissions at the state level than the EPA. If you live in one of these states, make sure any wood stove you purchase meets the state emission standards too. See the Oregon DEQ Air Quality page or the Washington Department of Ecology Air Quality page for more information about state-specific requirements. Colorado also has strict standards that are enforced during "Air Quality Action Days." You'll also see stoves classified as catalytic or non-catalytic. Catalytic stoves use a palladium-coated combustor to burn the gases produced inside the stove. Non-catalytic stoves use secondary combustion to burn off these gases. Some wood stoves are notoriously picky about what they can burn, but our best reviewed model, the Sedore 3000 (Est. $4,400) wood stove, is incredibly versatile. Not only can it devour anything from sawdust to wood chips, old pallets, unsplit logs and scrap wood, it's also capable of burning corn. The manufacturer advertises this stove as producing an impressive 30,000 to 125,000 BTUs depending on test conditions, and several users happily confirm the manufacturer's promise that the Sedore 3000 will heat up to 3,000 square feet of area. Owners also love the Sedore 3000's simple construction that's built to last. A few reviewers miss having a large window to let you watch the fire, although an optional add-on window is available for about $1,150. The stove's simple, dependable downdraft mechanism is another favorite design feature; owners say this workhorse of a stove easily holds coals for 12 or more hours overnight and can even burn whole logs up to 12 inches in diameter. It includes hot water coils that can be routed to your domestic hot water heater or hot water baseboards. The list of things owners love continues: The Sedore 3000's design allows easy ash removal and interior access for cleaning the stovepipe, and a downdraft design means the logs burn from the bottom up. The benefit of that feature is that if some of your wood is damp, you can lay it on the top of the stack where it'll have a little time to dry out before it burns. On the downside, the downdraft design means that if you get the drafting wrong, you'll be rewarded with a house full of smoke. If you're heating a large house, another great option is the Canada-made Drolet HT2000 (Est. $1,400). Although this EPA-certified, wood-burning plate steel stove is advertised for heating 1,000 to 2,400 square feet, one user reports that it keeps their two-story, 4,400-square-foot home warm during temperatures in the 30s. The massive firebox accepts 22-inch logs loaded side-to-side or front-to-back, and the firebrick lining is fully replaceable. Users love the Drolet HT2000's convenient controls and excellent airflow, and say that when well-stoked it can hold coals overnight. The top rear vent works well for circulating air by convection, although optional thermostat-controlled blowers are available. The only real complaints we saw about this stove are the note that it's overkill for anything less than 1,500 to 2,000 square feet -- Droler offers smaller stoves for heating smaller homes -- and that it's easier to shovel ash out than to remove the plug and sweep ash into the removable pan. If wood is going to be your primary heating source or you're heating a large area, a stove like the Sedore 3000 is well worth its price. If you're heating small areas or using the wood stove only as a backup or a supplement, however, many users are happy with a cheaper model. In that category, the best stove we found is the US Stove 2000 (Est. $900), a plate-steel model that produces as much as 89,000 BTU and can heat up to 2,000 square feet. In return for that much heat in this price range, however, you can expect some quirks. One of the biggest is an oddly shaped firebox with a too-small door; if you want to get the promised 21-inch-long pieces of wood in there, they must be split quite small. Other owners say the US Stove 2000 drafts only in the front -- so the back corners won't burn well -- and that it's easy to overfire. Reviewers add that the ash pan is too small, so ashes pile up quickly and restrict the airflow. On the upside, the US Stove 2000's firebox is firebrick-lined and it has a built-in 100-cfm blower, although said blower can get loud. Users say the assembly is quick and easy at about 15 minutes, and the US Stove 2000 is approved for use in a mobile home. Users report burn times of around 7 hours. New on our radar in this year's report, the Vogelzang Ponderosa TR007 (Est. $1,000) may soon give the US Stove 2000 a run for its top spot in this category -- but first, we need to see a little more user feedback. So far, owners say that this EPA-certified and mobile home approved plate-steel stove burns very efficiently, as long as you follow the manufacturer's directions for getting it started and use well-seasoned wood. It easily accepts 22-inch logs, and its firebrick-lined interior can hold coals all night long. The ceramic glass window stays clean with occasional wipe-downs, thanks in part to this stove's efficient secondary combustion. Maximum heat output for the Vogelzang Ponderosa TR007 is 152,000 BTU, and users say it can heat a home in the 2,400 to 3,000 square foot range. The Ponderosa doesn't have any fancy bells and whistles, aside from a 150-cfm blower that receives so-so feedback for noise levels and air circulation; and not everyone is thrilled about having to remove a plug before you can sweep ashes into the ash pan for disposal. But if you want a reliable, fuss-free wood stove at a good price, it's an excellent option. Also excellent in this price range is the Pleasant Hearth LWS-130291 (Est. $1,100). This steel stove puts out up to 77,000 BTU and is rated for heating up to 2,200 square feet, although we found user feedback that it's better for use in slightly smaller spaces. Users also say the Pleasant Hearth LWS-130291's burn times are more like five to seven hours at night, as opposed to the manufacturer's advertised eight to 10. They like the sliding draft control, but don't like having to stay with the stove for 20 minutes after starting a fire to make sure it doesn't overheat; several report installing a second damper in the chimney to give them better control over the airflow and reduce the risk of overfiring. Combine that with a front door that doesn't seal very well, and this probably isn't the right stove for frequent users. But considering the price range, it's still a great value for anyone who wants occasional wood heat as a supplement on cold days or as backup in case of power outage. The LWS-130291 comes with a built-in variable speed blower and a large glass window in its cast-iron door, with an air wash to help keep it clean. Another up and coming stove to watch is the Woodstock Soapstone Ideal Steel Hybrid (Est. 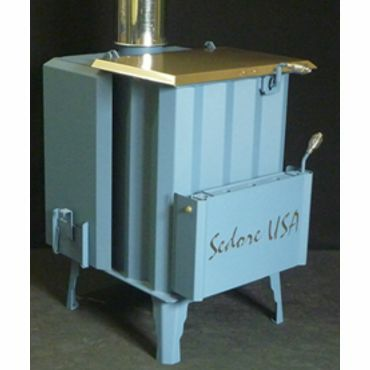 $2,050) stove, which won the very competitive Wood Stove Decathlon in 2013. The manufacturers opted for a simple catalytic/dual-combustion hybrid design -- albeit with some unique design elements that made it into production, including gear-shaped cooktop surfaces and ornamental side panels, all of which are optional. The front-loading Woodstock Soapstone Ideal Steel Hybrid puts out about 13,000 to 60,000 BTU according to EPA tests, and can heat up to 2,200 square feet. It has a front-loading 3.2 cubic feet firebox that's advertised for up to 22-inch logs, although users say 20-inch or shorter logs are easier to handle. On the basic model, said firebox has a fire-brick liner; if you opt for a higher-end model, you can get add on a number of features, including a soapstone firebox and side paneling that absorbs the stove's heat and offers a gentle, radiant warmth for several hours after the fire has gone out. Although there are very few user reviews for this stove to date, the early feedback -- not to mention the stove decathlon win -- are both very promising. Users say that burn times average in the bottom end of the advertised 10- to 14-hour range -- still plenty to keep you warm through the night. Fuel that's readily available in your area. A large pellet hopper or firebox.